One of the highlights of taking a tour bus in Las Vegas is a trip to the South Rim of the Grand Canyon and strolling the 13-mile (19-kilometer) Rim Trail. The Rim Trail allows tour bus visitors to see the Canyon at their own pace, and do so safely and easily. Following the edge of the Canyon, the trail rewards visitors with amazing scenic views and geological information. Heavily shaded and rising only to an elevation of 200 feet, this trail provides walkers a way to see the Canyon, regardless of their level of fitness or age. Beginning at the Grand Canyon Village, the Rim trail leads to destinations, such as Hermits Rest on the westside and Mather Point and Yavapai point on the eastern side. Depending on your preferences, you can either walk the trail (at a fast pace) in about two hours, or make the trail stretch for the day, strolling along the pathway and stopping off at specific points of interest. One of the sections of the Rim Trail you will want to slow down and visit is the Grand Canyon Trail of Time. This part of the trail represents an interpretive exhibit and timeline of the Canyon’s geological history over millions of years. Displays along this part of the path allow walkers to contemplate and further explore how the Canyon has evolved over time. Stretching 1.7 miles over the Rim Trail, this path runs from Verkamps Visitor Center to Lookout Station and the Yavapai Geology Museum. Brass markers convey timelines along the trail, each of which denotes about one million years geologically. The easiest way to access the Grand Canyon Trial of Time is to begin at one of the parking lots in Grand Canyon Village. A free shuttle bus can also take you to each end of the trail. Stroll, at your leisure, from the Canyon’s geological present to past by going west, starting at the Yavapai Geology Museum. The Verkamps Visitor Center is where you want to begin if you want to move east, or from the past to present. 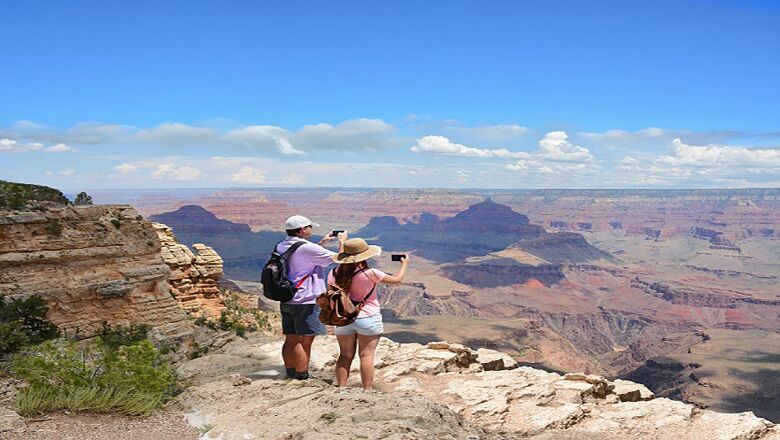 By taking a tour bus in Las Vegas, such as one of the luxury vehicles featured by Grand Canyon Destinations, you can schedule a South Rim walking tour and learn more about the fascinating geological history of the Grand Canyon. Whether you have an avid interest or passing fancy in the subject, you will find the information enlightening and insightful. One of the best times of year to visit the Grand Canyon Trail of Time is in March or April. Not only are the temperatures amenable, the crowds will not distract you from reading the markers and taking in the sights.